It’s time for more crafty sales and news! First of all, many people have asked if I will be doing My Favorite Crafty Things of 2017. Yes – I plan to! However, there is not going to be a schedule for it. Since I am a stay-at-home-momma first and foremost, I just have to go with the flow. Thanks for your understanding! I will also have other cardmaking videos during the MFCT2017, so if you prefer those, no worries. Now it is time for some sales and must-sees! Gina K Designs & Unity Sales – These two companies are having a sale at the same time! Good now through 11/13/17. Gina K Sale – Get 15% off your purchase with the code “UNITY15” when shopping HERE. Unity Sale – Get a free Itty Bitty stamp with the code “GINAFREE” when shopping HERE. And they are having a site-wide sale! When shopping at Gina K, I highly recommend her inks (the cubes are great, too! ), cardstocks, and envelopes. This is a good time to stock up on essentials! My Favorite Things Sale – Today (11/10/17) only, get 20% off all of the products in the My Favorite Things’ “All That Glitters” category. Use the code “SPARKLE” when shopping HERE. 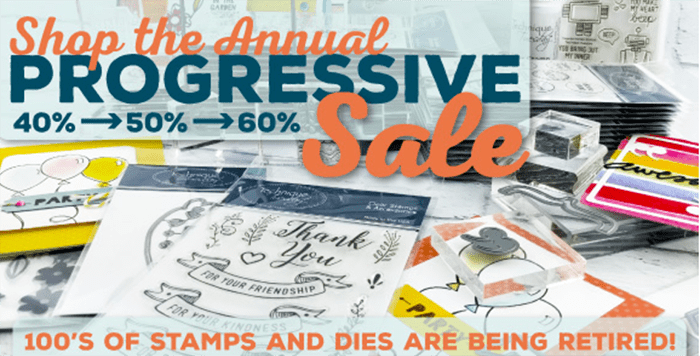 Altenew Sale – Save up to 33% off stamps, dies, inks, and more in Altenew’s sale category. Shop HERE. NEW Honey Bee Stamps – Honey Bee Stamp just released several great new products. I hope to use some of them in a video soon! Find them HERE at Honey Bee or HERE at Simon Says Stamp. Sympathy Stamp Set – I get a lot of emails asking for suggestions on sympathy stamp sets. Well I found one! Check out the new Paper Smooches Sympathy Sampler. You can find it HERE. Papertrey Ink Stamp – I do my Christmas cards right after Thanksgiving each year. I use a photo but make it crafty… and everyone gets the same one. But for the first time I don’t yet have an idea in mind! I usually do by now. But I just saw this Papertrey Ink Mini October Stamp Set and I am thinking I may use it. So pretty. I just ordered it – it is only $5! You can find it HERE. See you soon, crafty friends! I’m a big PTI fan and am so pleased that you (one of my favorite designers of all time) have mentioned them. I don’t know any of their designers personally nor the owner but they seem to be ignored by ‘free range’ designers, so thanks for mentioning them and one of my favorite stamps, also. Thank you for all the time you take to summarize all these informations for us, it’s so useful. I’ll be happy to discover all your next posts, whatever the themes are, as I always learn something watching your videos ! Have a great end of year ! So excited for the My Favorite Crafty Things series! I love to see what you think are some of the best products of the past year. I have a small crafting budget and am always a little weary of trying something new, but I do know that if you recommended it in your favorite crafty things, it really is awesome. I’m so happy I invested in things like the MISTI, a Fiskars paper trimmer, Lawn Fawn acrylic blocks and good quality stamps and dies. It has made crafting so much easier and so much more fun! I am new to all of this and so far, I love it. I have beeen so confused about how to do somethings and where to purchase supplies and tools but thanks to you; the fog has been lifted. I have learned so much in the past two nights simply by watching your videos. I cannot wait to try some of the ideas you present. Thank you so much for sharing your knowledge and the love of crafting. I love the Concord & 9th plaid background stamp.